Keihanna Science City has been constructed under a Japanese national project, and 30 years have passed since its construction began. Currently, there are more than 130 research laboratories, universities and companies located in this area, and these have been achieving many leading-edge outcomes in research and development. 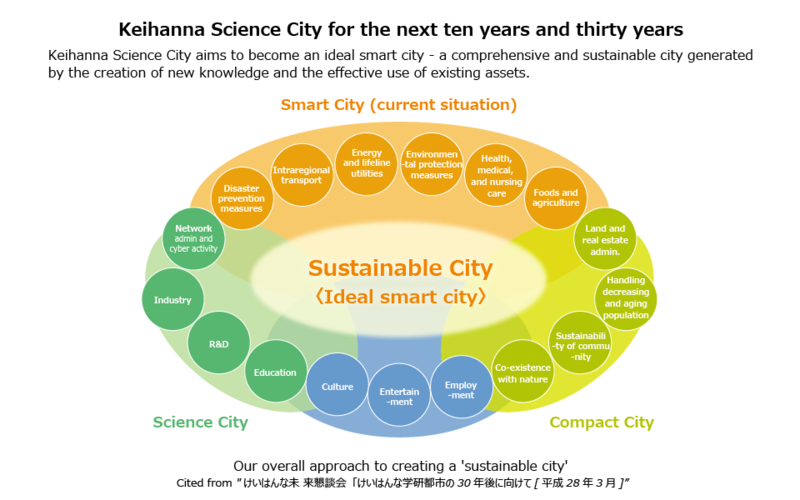 Now that the city has entered its next phase, the Keihanna Research Complex project, called Keihanna RC, is stimulating organizations in this area to cooperate with others, both within and outside the area, in the pursuit of world-class innovations. The project is being promoted with a variety of tools: integrated R&D in different fields; human resources development; commercialization support; equipment sharing; and an innovation hub & overall promotion. 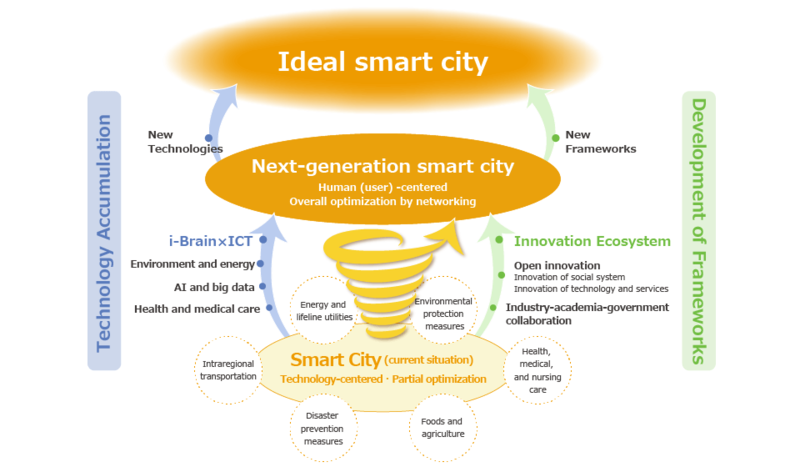 We will create a next-generation smart city with ‘Meta-Comfort,’ which aims to generate empathy in people’s hearts, by piling ‘i-BrainｘICT’* on top of the technologies that have been developed in Keihanna Science City over many years and establishing a framework to nurture new business, aiming at an innovation ecosystem. *i-Brain：Brain and human science technologies, or a set of technologies that quantitatively and objectively measure people’s feelings and emotions based on analysis of human psychology, behavior, and brain and biological data. 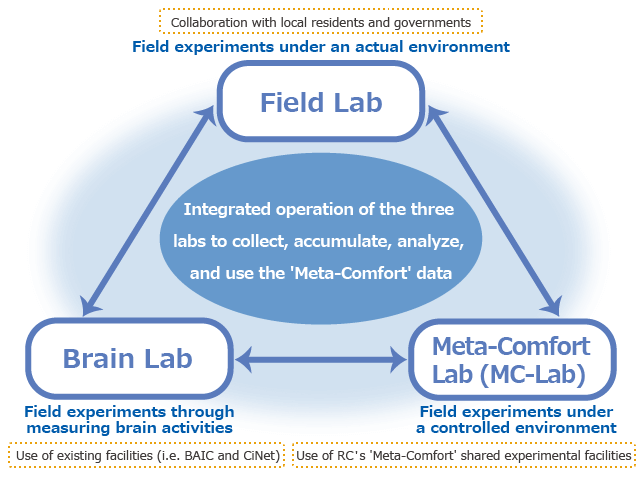 Keihanna RC constructed a ‘Meta-Comfort’ experimental field consisting of three types of laboratories — “Field Lab,” “Meta-Comfort Lab,” and “Brain Lab” — to create new business by taking advantage of the various data collected through the experiments conducted there. We constructed an innovation ecosystem capable of generating a chain of innovations by continuously attracting organizations and funds from home and abroad. 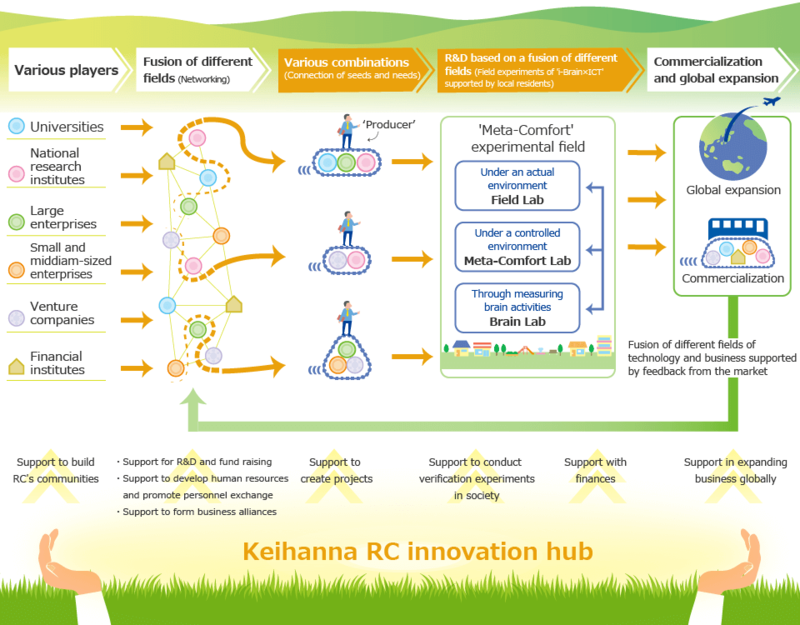 By constructing the ‘Meta-Comfort’ experimental field and Keihanna innovation ecosystem, we are creating a research complex with a superior driving force. 1. “Open innovation” created by various combinations of various players such as research institutes, universities, enterprises, and venture companies 1. Field experiments in ‘Meta-Comfort’ experimental field in cooperation with local residents who share a strong awareness of future-looking technologies. 2. Matchings of business needs and seeds by a ‘producer’ — a person who has the creativity to elaborate a plan from scratch, establish a human organization, collect funds, manage a project, and evaluate the outcomes through public reactions — to create new projects 2. R&D and commercialization by taking advantage of ‘meta-comfort’ data collected and analyzed at the field’s three laboratories. Click a button below to learn more about each tool.